Is there a more iconic symbol of a log cabin than a roaring fire? A wood fire in an open fireplace feels so inviting on a cold, snowy winter day, but as we all know fireplaces are colossally inefficient. 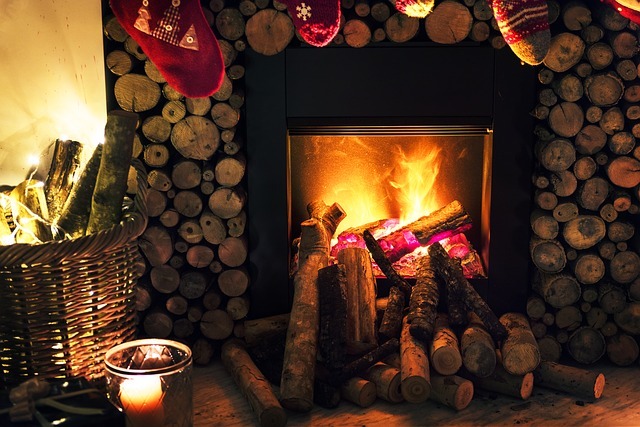 It’s often said that more heat goes up the chimney than actually into the room resulting in actually making the home colder. So, if it’s -15° on a cold Kalamazoo night now are you going to enjoy that fireplace. One of the best ways to get optimum performance from a fireplace is to use seasoned wood. Green or fresh cut wood that’s still wet will create a lot of smoke and not burn as well. Wood that’s had a year to season and dry is much cleaner burning and more efficient. Hardwoods like oak or maple also aren’t the hottest burning wood. If you want the maximum amount of heat, Douglas Fir is a good wood that creates a lot of heat without burning too quickly. One thing rarely mentioned but is a traditional method of getting heat from a fireplace is a fireback. Dating back to the 15th century, a fireback is a steel plate used to protect the back of the firebox and to make the fireplace more efficient. The iron absorbs the heat and then radiates it out to the room. Some houses in parts of Belgium, France and Luxembourg were built with iron plates in the walls behind the kitchen fireplace. This allowed the heat from the kitchen to warm the adjoining rooms. Firebacks were often decorated with elaborate designs including coats of arms for royalty or the church. Some were images if mythical subjects, religion or national pride. As coal replaced wood in heating many homes, firebacks fell out of favor, but for your wood burning fireplace, they can be a great choice. A good fireplace insert will make your fireplace much more like a wood burning stove. Some even integrate blowers that will heat air in double-walled construction and blow that warm air out into the room. Another popular choice is to use an insert that burns natural gas rather, replacing the ability to burn wood. This gives a sealed, efficient unit that is available at the flick of a switch, of course, you miss the crackle and pop of a wood fire, but it creates less smoke, is better for the environment and much more economical both in terms of fuel and actual heating of the home. No matter what you decide, a fireplace is a great component to make your home feel more rustic, just like TruLog Steel Log Siding will give your home’s exterior that log home feel.